Halstenberg (l.) kept Aubameyang (r.) subdued in the reverse fixture, but isn't expecting a repeat... necessarily! 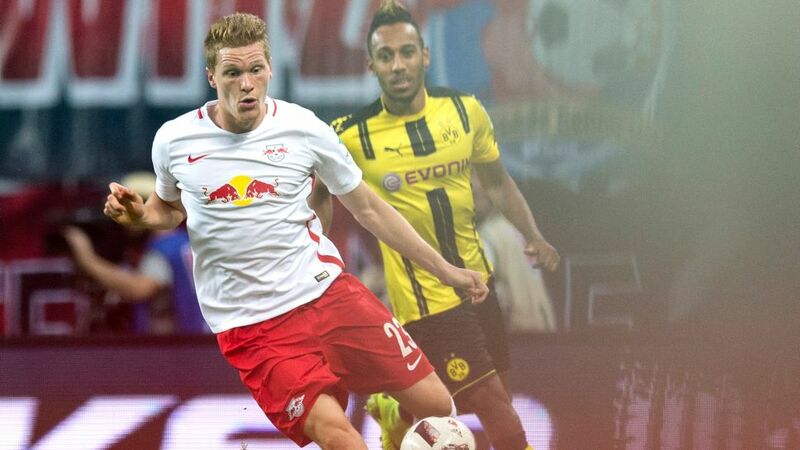 RB Leipzig left-back Marcel Halstenberg has been a key component in the eastern club’s climb up the Bundesliga table, but he insists his former employers Borussia Dortmund are the favourites when the two collide at the SIGNAL IDUNA PARK on Saturday (kick-off 18:30CET/17:30GMT). Halstenberg already has 142 Official Fantasy Bundesliga points! Snap him up here! bundesliga.com: Marcel Halstenberg, some say that it is no surprise that RB Leipzig are FC Bayern München’s nearest challengers, others point out that RB are not your typical promoted team. How do you and your teammates see it? Marcel Halstenberg: Of course we couldn’t expect this kind of form, but it is also true that we may not be your typical promoted team, as has been highlighted by the press repeatedly. The potential of the team and the club should now be clear to everyone. We have a great set-up and can always give the weekends our full concentration. This is crucial to getting the best out of us. However, the fact we are Bayern’s closest challengers after 18 games – I don’t think anyone would have predicted that at the start of the season. bundesliga.com: It is striking how quickly this very young team has climbed up the rankings. Where do you and your teammates think you can finish? Halstenberg: We take it one game at a time, but we are hungry to win every game. We run hard and try to exhaust our opponents. Pressing high up the pitch also works very well. We are good at recovering the ball, so we can score goals quickly on the counter-attack. We also enjoy our game. bundesliga.com: In September, you said in an interview that: "We are newcomers, so we’re underdogs in every game." But now your next opponent, Borussia Dortmund, trail you by 11 points. Is RB now the favourite? Halstenberg: (Laughs) No, certainly not, I really don’t see it like that! Although we are 11 points ahead of Dortmund, that doesn’t mean that we’re unaware of their high quality and experience. I have only played 18 Bundesliga games so far. The same goes for some of my teammates. Many of us will be playing for the first time at the SIGNAL IDUNA PARK. Also, against the Yellow Wall we are clearly the guests and it is no question, still the underdogs. Like Bundesliga Official on Facebook! bundesliga.com: Do you feel that opponents now have more respect for you than at the beginning of the season? Halstenberg: Perhaps some of our opponents underestimated us a bit in the Hinrunde. However, they have all probably acknowledged the setup we have here. They take us seriously, and we’ll have to adjust to this. Halstenberg: It’s a little out of the ordinary for Dortmund just now, and there is a lot of discussion about the coach and the team. BVB are simply a club that demand a lot. The potential this team and group of young, talented players have is huge. Not everything is clicking into place yet. A rotation in players like they had last summer can take some time. We are not driving to Dortmund to go and get slaughtered. We want to take at least a point, or, as we managed in the reverse fixture, all three! bundesliga.com: You know Dortmund well, having played for their reserves between 2011 and 2013. Do you stay in touch with any teammates from that time? Halstenberg: Yes, but only really those who have since moved on too, like Florian Hübner, who is now at Hannover 96. I’m in closest contact with Jonas Hofmann, who now plays for Borussia Mönchengladbach. Halstenberg: I’m aware that I play an important role in this team. I try to show the coach in every game that he can always trust me. Of course, I am very grateful to him and he always gets everything possible out of me. I've become a much better player at the club. Halstenberg: I ​​always try to play fair, but I also know that sometimes in a game you have to play hard. Fortunately, I have not been embarrassed yet or forced to commit tactical fouls. Only two yellow cards is unquestionably a nice thing. Maybe I’ve just been lucky with the referees. Halstenberg: Well, first of all success of the team comes above all. Of course I was also very happy with my two assists against Frankfurt, and I wouldn’t mind being able to celebrate a goal of my own! That would be a wonderful feeling. bundesliga.com: Your career has progressed step by step, from the fourth tier all the way to the Bundesliga. Was it sometimes a bumpy journey? Halstenberg: I’d like to put it this way: I have seen many sides of German football. The regional leagues were great at the time as we earned promotion [With Borussia Dortmund II and Leipzig]. I remember playing with lots of long balls. Being robust and combative was most important. The fact I was able to train with BVB’s first team at the time was a great thing. I’ve learned a lot – also at FC St. Pauli in Bundesliga 2. Of course, promotion to the Bundesliga with RB was the highlight of my career so far. Now we have to work hard to not just stay in the Bundesliga but also to give a good account of ourselves there. bundesliga.com: The next step might be the national team. Were you nervous when you heard Germany coach Joachim Löw was in attendance in the 2-1 win over Hoffenheim last Saturday? Halstenberg: No. I just wanted to do my job, which I guess I did quite well. Of course playing for the national team would be a dream. But at the moment my primary focus is on RB. For more on Dortmund-Leipzig, head to the Match Centre!